Sundar Pichai, lately the CEO of Google and a huge figure in the world of Android, is apparently considering the advice of his dear mother when it comes time to name the next release of Android. 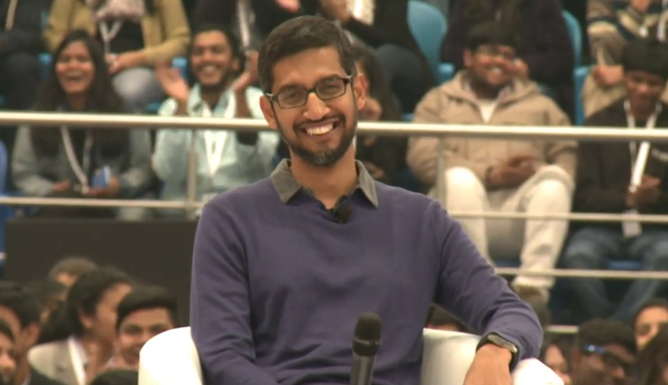 That's according to a question and answer session Pichai gave at Delhi University, where topics such as football (soccer) and cricket were also broached. But he won't be considering his mother's input alone. "Maybe what I'll do next time, is when we're working on the next release of Android, Android N, maybe we'll do an online poll on what the name should be. And if all Indians vote... I think we can make it happen!" Each successive iteration of Android is given a new nickname, going in alphabetical order from Cupcake (1.5) all the way to the current Marshmallow (6.0). Every new announcement is anticipated almost as much as the software itself, with Google incorporating the nickname into promotional efforts and branding, including the famous Android version statues at Google's Mountain View headquarters. Previously the official name and number for each new version has been a closely guarded secret, but expanding the system to encourage user participation couldn't hurt. And as Pichai says, with the enormous amount of Android users and enthusiasts in India and elsewhere, it might indeed result in some more international dessert choices. The full 73-minute question and answer session at Delhi University has been posted to YouTube. The fun bit about Android names starts at around 47 minutes, but the rest of it is interesting for anyone looking to learn about Google and Sundar Pichai's plans for the Indian market.